We use Pack & Send for all our deliveries. All pricing below is based on delivery of a single floor lamp (2 boxes) to Metro areas around Australia, please confirm your postcode is within their definition of 'metro' areas (prior to purchase) here. 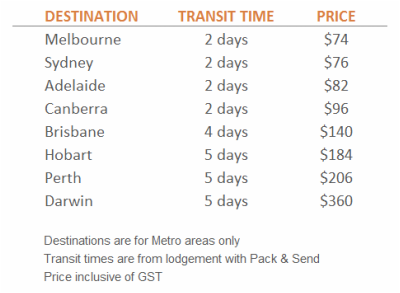 If your postcode falls outside of these metro areas, you can either choose to have the goods delivered to your nearest Pack & Send store (over 100 stores Australia wide) for your collection at a convenient time, or contact us with your address details and we will obtain a shipping quote for you. The pricing in the below table includes address labelling, documentation, courier delivery to the door, track & trace and recipient signing for delivery. If you wish to arrange your own shipping, we are happy to box and label the items for your courier to collect from us. Simply select 'pickup' at Checkout and advise you will be arranging your own courier.